Scorched pepper and white bean couscous. before and after soaking overnight. Weigh out 100g of dried white kidney beans. Wash them three or four times and then put them in a container with at least double their volume of water and cover with a lid or shrink-wrap. Leave overnight at room temperature to soak. Scorch the surface with the direct flame. This will give it a flavour you cannot get with frying. The following day, drain of the water and boil for one to two hours or 1 hour in a pressure cooker. * Tip - If you are in a hurry and haven't got time to prepare your own beans - or if you are just too lazy - use a tin of canellini beans or butter beans instead. 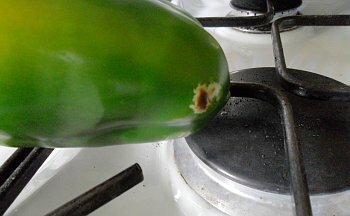 Wash the peppers and then, one at a time, stick a fork in them at the stem end, put on a gas ring and then hold the peppers in the flame, so that the brightest part of the flame is in direct contact with the surface of the pepper, and cook it until it pops. 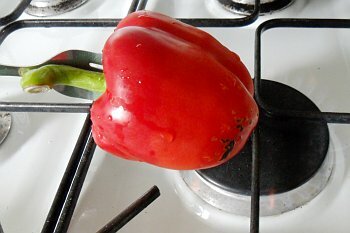 Slowly rotate the pepper so that you cover an area of a few square inches. Repeat with the green pepper. You only need do this to a square inch or so. Repeat the process with the green pepper. 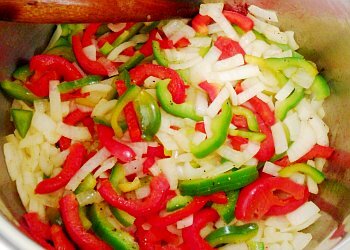 Note that the smell is different and that the green and the red peppers both contribute something different - it is not just about making it look pretty. Chop up the peppers and put them in a pot with some olive oil and start frying them. Chop up the onion and add that to the pot. Press the garlic into the pot and add some freshly ground black pepper. Cook until the onion starts to caramelise. Next, add around 500-600mls water and bring to the boil. Add the miso and disperse it by stirring the water. Drain and then add the beans that you have cooked. of rice. These are 1-2mm across. Add the couscous and stir it so that it doesn't stick to the bottom. The couscous should soak up all of the water in the pan and end up as separate grains, like little pieces of spaghetti. If it looks as though it is going to dry out too much - without cooking the couscous correctly - add some more water. Once it is too thick to stir, put the lid on the pan and turn off the gas. Leave it for 20 minutes to finish off cooking. Break it up and divide it into your three lunch boxes. can put on it whatever you like. 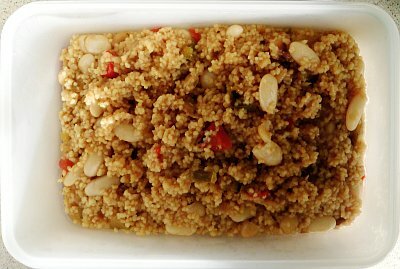 Couscous is a rough equivalent to rice so anything from the flavour groups that you would use with rice will do.